EGADS! You are correct! Still prefer "Stairway to Heaven" as the title. This spiffy new Criterion cover makes it look like it should be called just that! any news of alligator getting a bluray. Is it weird that I really want to get the John Wick/John Wick 2 double feature steelbook from Best Buy but just can't bring myself to because the spine just says 'John Wick' instead of "The John Wick Collection" or "John Wick/John Wick 2" and I can't abide the improper labeling? You could just think of it as the character’s name and not the film title. Like a box set that just says “James Bond” or “Indiana Jones” on the spine. ^After John Wick 3 comes out the spines will read "John Wick" and then "John Wick 3." It'll be like I'm missing part 2! lhb412 wrote: ^Always love Criterion's original artwork for these movies. Can't wait to see what they do for Godzilla! 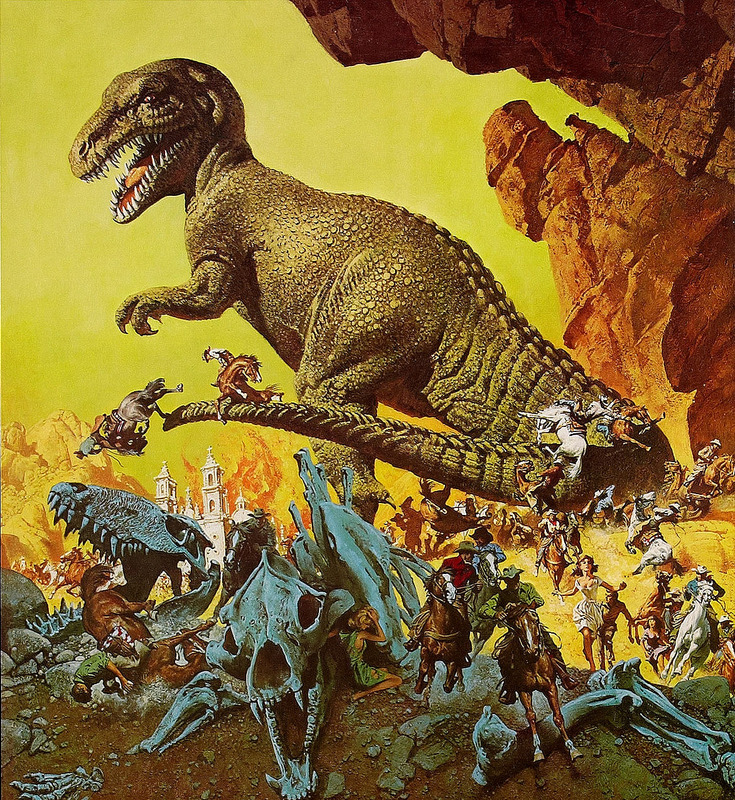 Fingers crossed for Bob Eggleton. Or maybe a Japanese artist like Yuji Kaida. 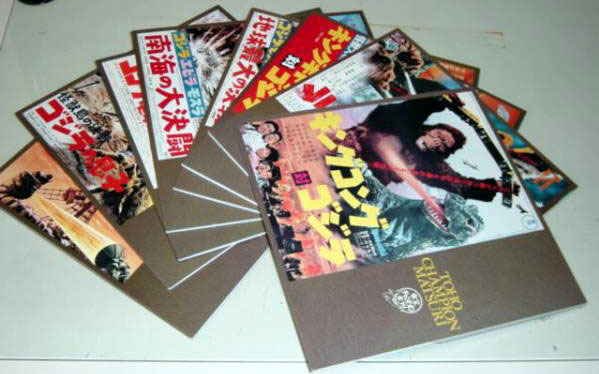 It'd be cool if they used the same approach they had for the Zatoichi set, where they got a big group of artists who worked in different mediums, had radically different styles and approaches - that Blu-Ray/DVD set is as much an artbook as it is packaging for discs! In a perfect world each film would have its own case, but I'm not really expecting that. Anyone have the HK Blu-Ray of Inframan? I'm curious how the HK blu-ray compares with the HD version that Amazon has up (it's viewable with Amazon Prime). The HD version up on Amazon looks and sounds worlds better than the DVD. Oh man, I used to have this tape. 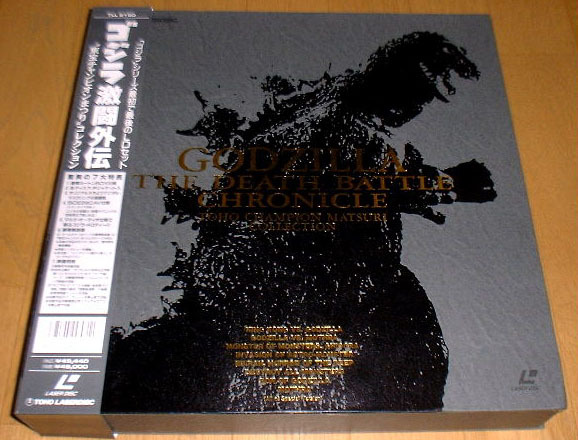 First Godzilla movie I ever owned. 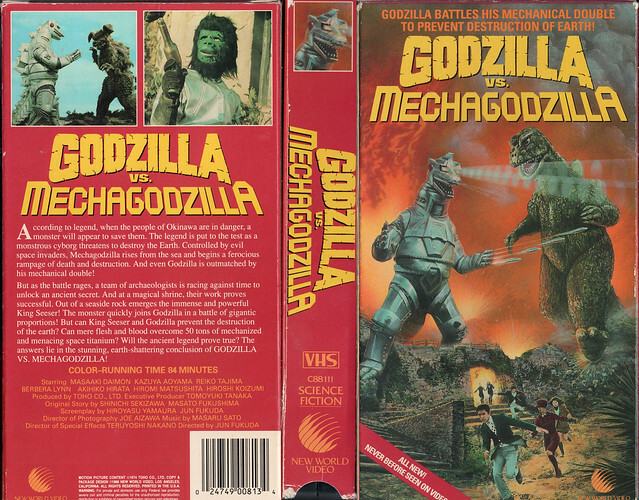 ^ So, I guess New World Video picked up the video rights to vs. Mechagodzilla and vs. Gigan because Godzilla 1985 was successful on home video? Our national nightmare is over: Creature From the Black Lagoon and Invisible Man Legacy Collections coming to Blu-Ray this August. lhb412 wrote: Our national nightmare is over: Creature From the Black Lagoon and Invisible Man Legacy Collections coming to Blu-Ray this August. Wonder what took Universal so long? I feel that the movies in the Gill Man & Invisible Man series are more popular than their Mummy franchise. But glad the long wait will be nearly over. I guess the extra work of remastering Revenge of the Creature in 3D held it up? I understand the desire to get the Mummy set out to tie in with the new movie. Cool news, but ultimately I think I'll just stick with my Complete Legacy DVDs. Can't imagine the blus really being worth a double-dip. From what I've read on the Blu-ray.com forum, it looks like Universal is also releasing the Complete Legacy Collection set on blu-ray as well. ^you mean like one giant box set with all the various individual monster legacy Blu-ray sets combined into a single package? Hmm... that’s tempting. I was just adding all the legacy BD sets to my amazon wishlist the other day because all I have is that original Blu-ray set that contains basically the first classic film for each monster. That's what it sounds like, I know that Universal released a combined set of the Legacy Collection DVDs (in 2014). If Universal just recreates the DVD box set it looks the blu-ray collection will be the individual Legacy Collection releases in a large slipcase; the DVD set includes a 48 page booklet, I don't if that will be in the blu-ray version or not. EDIT: Well, now I can't find the links in either the Creature or Invisible Man threads in Blu-Ray.com's forums to info on a blu-ray release of all the Legacy Collection sets. Maybe it was listed as coming in error and the poster has since edited their post? Right now the only store listings that turn up are for individual Legacy Collection sets. So maybe no big set on the way currently.